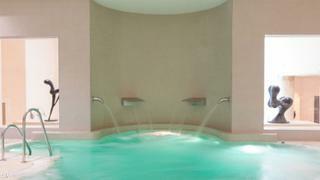 One of the pools at Malaga's Healthouse Las Dunas, where Naturhouse spa resides. 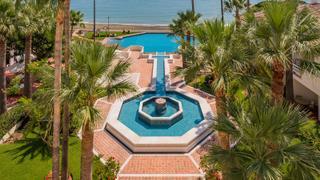 The Naturhouse group have set up a residence in Malaga, next door to Mediterranean superyacht hotspot Marbella. Inside the sprawling Healthouse Las Dunas resort, which sits on the Costa del Sol beachfront, guests will find an expansive health centre with treatments, pools and programs a-plenty. Swap your champagne for a Shirley Temple and sign up for yoga, aqua gym and Nordic walking at this Hacienda-style oceanfront resort. Famed as a one-stop shop for total rejuvenation, its terracotta patios and postcard-worthy whitewashed villas are a welcome reminder you’re on holiday (even if the Barry’s Bootcamp is going to have you doing so many press-ups that your muscles spasm). Its medical spa is a warren of polished sand-coloured stone, high ceilings and warm sconce lighting. It’s also packed with trendy additions to keep its gym-bunny residents entertained, including a salt cave, snow cabin and flotarium (where you are suspended effortlessly in saturated solution of Epsom salt and water). Those brave enough (or desperate enough to beat cellulite) can try its manual aquatic massage. It starts off gently in a cushioned bath, where jets of warm water are applied in rhythmic movements, easing tight muscles and aiding lymphatic drainage. The tide quickly turns, however, as you stand to be pummelled with short blasts of ice cold water in a wet room. It might sound a bit Orange is the New Black but it is guaranteed to leave you ready for your next health snack prepared by Michelin star chef, Andoni Luis Aduriz. Drop your yacht in Puerto Banús, which can accommodate yachts up to 63m and is a 15-minute spin from the hotel.